Congratulations on your new addition!!! Josie is absolutely beautiful!!!! Yeah- love Josie! 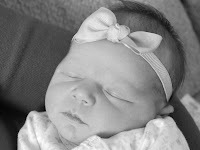 She is such a little doll and I love the bow on her hair!